Nowadays, the concept of bobble dolls is gaining the maximum popularity for their unique and extra ordinary appeal. These dolls are most created as customized bobbleheads as per the needs, preferences and purposes. These dolls can be either self-created or can be developed by some expert and skilled sculptors. I would like to have some hands on making a wonderful bobbling doll by your own. Here are some tips. Examine the images to be sculpted first. Cut the wire for the feet, legs and hips with a piece of 20 gauge wire and bend the wire in the form of “U” with a clamp. Winding the wire body with a foil. Wrap the foil at the bottom of the legs with 24 gauge wire. Knead the polymer clay with fingers and make it soft and pliable. Now cover the foil on body with the soft clay, smoothing with fingers. Drill two small holes in the base of oval artistic wood positioned at the same width as the wires in the feet. Place the wires in the holes to help sculpting. Cut a piece of 20 gauge wire for the body and push it vertically in the clay portion of the lower body. Cover it with clay, shaping the torso, neck and shoulders. Make shoes for the figure with two balls of clay. Remove the figure from wooden base and insert the wire through shoe. Glue the feet in the holes in the wooden base with epoxy glue. Now do the best sculpting for clothing in the clay with a knife and a needle tool. Sculpt arms and hands with clay and tie shoulders. Make an enlarged clay head. Referring to photos, sculpt facial features, hair and ears with tools for clay sculpture. Bake that sculpted head and body in an oven at 250 degrees for one hour. Paint the body and head with acrylic paints and brushes. Deeply check figure such as eyes, lip color, cheeks, freckles, buttons etc. Create a spring in place on top of the neck of a double length of wire, fold in half and turning with tool. This makes the doll head bobbling. Wrap the twisted wire around a pen. Cover the ends of the twisted wire with polymer clay, and one end of spring epoxy resin in the upper part of the neck. Drill inside the bobblehead enough to scoop the head balances well on the spring. Place the bobble head on top of the spring and glue it with epoxy. Add embellishments such as earrings wire or a flower made of polymer clay and etc to give a final look. 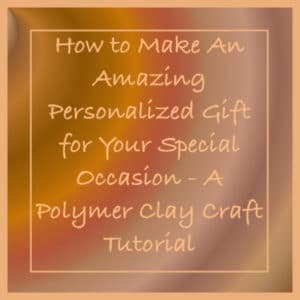 So this is what you can make a perfect personalized gift for your special occasion if you love arts and crafts. It is not difficult to achieve better accuracy like the sculpture. Just start making yours with creativity and faith I am sure that model will be exact match of your model image. Add bit emotions and expression to it and I hope that will be excellent to impress anyone. Good Luck. For an original and personalized gift that will immortalize an important event or reward the important people in your life, visit www.1minime.com today!